It's been quite some time since I last posted, and I think it's just time that I revive this blog. Since last posting, I discovered that I was pregnant and I am very excited to announce that I am expecting a little boy on May 5th, 2014! In October, I started crocheting a blanket for my little nugget. At the time, I did not know whether I'd be having a boy or a girl, so I decided on a basic rainbow pallette. 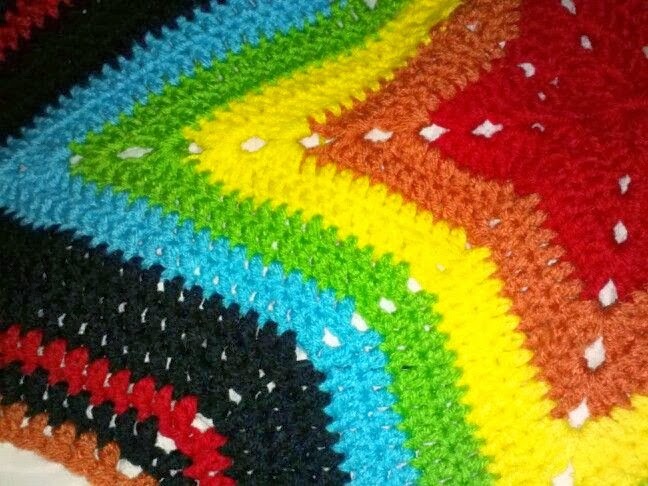 I had made this awesome star-shaped afghan a number of years ago for a friend's baby, but was very disappointed to discover that the pattern was no longer available. I did a little searching for something similar, and came across this pattern by Michael Sellick. I have altered it a bit, such as using an H hook and making only two chains at the peaks, rather than three chains. Using two chains instead of three seems to keep the peaks (or arms, whatever the hell you want to call them) a little less pointy. I actually like Michael's pattern a little more, it's very similar to the first starghan I made, but having the chart was really helpful. 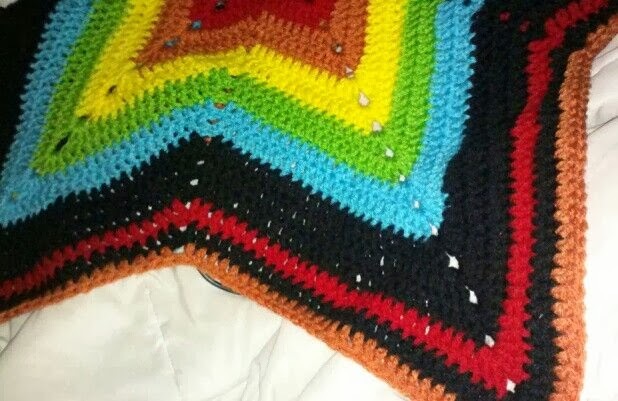 The beginning of this blanket is kind of tricky and I must have had to re-do it about a half dozen just because I was unsure if I was doing it the right way. Of course, I ended up losing the crochet hook I was using and didn't have a backup H hook. Damnit. I even rearranged the room that I lost the thing in, and it hasn't turned up, three months later. And of course, every time I went to the store, they were out of H hooks. I ended up finding a set of 12 aluminum crochet hooks on Amazon for $4 (no shipping! ), but it would take around three weeks for them to be delivered. Whatever. That's a good deal, and I could wait another 3 weeks to have an extra 11 hooks for only $1 more than a single one. They finally arrived two weeks ago. In the meantime, I found out that we are having a boy. Is this a pattern that you would try? Have you done something similar? I would love to see pictures!